Yesterday I had an exciting golf experience. 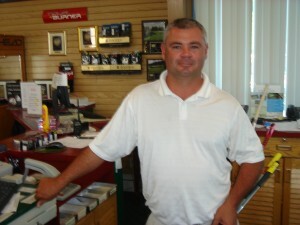 My teaching pro–Mark Bowen, pictured giving a lesson to Lauren Bell–gave me a 90 minute lesson. I went to him because I was having a big problem with my short shots into the green, those of 100 yards or less. This was especially frustrating because my tee shots have been long and straight, yet I couldn’t score well because my wedge shots were unreliable. Mark watched me hit a few shots, so he could identify the problem. Then in less than 15 minutes, he showed me the right grip, stance, and swing motion that would almost guarantee success when I followed his directions. Next, we practiced hitting shots to the green from different distances, from as close as 10 yards up to 83 yards away. Mark demonstrated the changes I would need to make to adjust to the varied distances. To my delight, the last 7 shots I hit to a green from 83 yards away were incredible. The were right at the target. Two of them almost went in the hole. Notice two big points here. One is that I have played golf avidly since age thirteen. I have taken many lessons. Yet there is always more to learn. I slip into bad habits that I can’t see myself. Only my golf coach can spot the problem and provide a solution. The second point is that under the watchful eye of a skilled coach, I improved dramatically, hitting difficult shots with an ease and confidence I had never felt before. Today I practiced for another hour, to make sure I remembered Mark’s tips. Fortunately, I did, and I hit many shots I was incapable of hitting just three days ago. If you’re a golfer, I recommend that you contact Mark, Director of Golf and Head Professional, Chattahoochee Golf Course, Gainesville, Georgia. His phone: 770-532-0066 . His instruction will become one of your finest golf investments. As Columbo used to say on TV, “Oh, and there’s just one more thing. . . .” A few minutes ago, it dawned on me that this is why I provide communication coaching for individual clients. Like Mark Bowen, I get tremendous satisfaction from helping others strengthen their skills. One of my clients learns how to rely less on notes while giving a speech. Another one learns to control stage fright. Another client uses Power Point more effectively. I love to watch their progress.